One of NASA's twin Grail spacecraft has returned its first unique picture of the far side of the moon, an image that shows shadowed craters at the moon's south pole. A gravity-mapping spacecraft orbiting the moon has beamed home its first video of the lunar far side — a view people on Earth never see. The new video was captured by one of NASA's twin Grail probes using a novel camera called MoonKAM, which will eventually be used by students on Earth to snap photos of the lunar surface as part of an educational project. The two spacecraft have been circling the moon since they arrived in orbit over the New Year. "The quality of the video is excellent and should energize our MoonKAM students as they prepare to explore the moon," said Maria Zuber, Grail principal investigator from the Massachusetts Institute of Technology in Cambridge, in a statement accompanying the video's release today (Feb. 1). The new video is about 30 seconds long and shows the far side of the moon as a stark, scarred landscape. 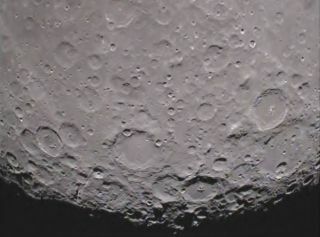 Dozens of craters are visible in the field of view. As the video begins, the vast impact basin of Mare Orientale — which is 560 miles (900 kilometers) wide and straddles the near and far sides, is clearly visible in the lower third of the frame, according to a NASA description. To the left of the middle is the Drygalski crater, a 93-mile-wide (149 kilometer) basin that stands out because of the star-shaped formation in its center. While NASA released the lunar far side video today, it was actually recorded Jan. 19 by one of the Grail probes, which are now called Ebb and Flow. The Grail mission's name stands for Gravity Recovery And Interior Laboratory. Both spacecraft are equipped with their own MoonKAM (or Moon Knowledge Acquired by Middle school students) cameras. The MoonKAM project is an effort led by former astronaut Sally Ride, the first American woman in space, to encourage student interest in science. It is the first set of cameras ever to fly on a NASA planetary probe that is completely dedicated to education and public outreach. Under the program, thousands of students between fourth and eighth grade will be able to request targets on the moon to be photographed by the Grail probes via an operations center based in San Diego, Calif. Once the photos are taken, they will be sent to the students for further study, NASA officials said. "We have had great response from schools around the country; more than 2,500 signed up to participate so far," Ride said, adding that the first moon photos taken by students will be recorded in mid-March. "I expect this will excite many students about possible careers in science and engineering." NASA launched the $496 million Grail mission in September 2011 on a tag-team mission to map the moon's gravity field like never before. The two washing machine-size spacecraft are currently lowering their orbits around the moon and will eventually begin the science phase of their mission once they reach a target altitude of just 34 miles (55 kilometers) above the lunar surface. Grail mission scientists will use minute changes in the positions of the lunar orbiters as they fly in tandem to map variations in the moon's gravitational field.